For those who are using wireless, please consider that there may be others in your area on the same channel that you are using. In order for you to get the fastest, most reliable connection, choose an unoccupied channel, if possible. The best channels to use are 1,6 or 11. These are non-overlapping channels, so there is less chance of local interference. Also, if your router or computers have adjustable antennas, make sure that all antennas are using the same polarization! This generally means aim all antennas up (vertically! ), or, if you have a way to monitor signal strength, you might find that a different orientation gives you a stronger signal. He talks about this, and apparently the best position is an L one antenna UP and the other one facing off to the side..
4. Be smart about antenna orientation. 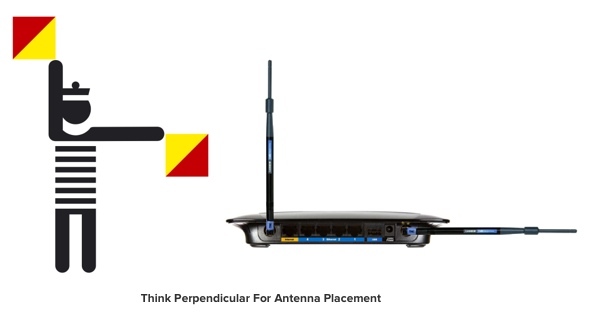 If your router has internal antennas (as most new models do), make sure to use them in their natural orientation. Put simply: if the router has feet, use them as feet (as opposed to laying it on its side). Some routers have feet on two sides and give you placement options, so feel free to capitalize upon this flexibility. For routers with those adjustable, "rubber ducky" antennas, Alf recommends pointing one straight up and one flat out. This is because radio reception is maximized when both client and access point have matched polarization (antennas pointing along the same plane). Those tips should get you started. Give Mac Geek Gab 509 a listen to learn more about beamforming, the future of Wi-Fi, how your router decides what country it's in (and what channels it can use! ), the future of iStumbler (and other products from Alf) ... and more! Sounds to me like he is hedging his bets and splitting the orientation in case one antenna does not have the same polarization as the other. I still maintain that in order to get the best signal capture, both antennas should have the SAME orientation as the other device, unless the device has two antennas that ARE oriented vertically AND horizontally! That's not too likely. In any event, the best of all worlds is to use an app that shows signal strength and move the antennas a little at a time for best strength. Also, if the antennas are removeable, you can always add a higher gain antenna. Just don't get too carried away, because you really don't want to spill any RF past your receiving area. By doing so, you are leaving yourself open to war drivers! He's actually on board with you and the polarization, however he is taking into account that not all wireless devices connected to pc's laptops etc are created equal. Many of them are horizontal and many vertical. Your antenna placement is optimal only for some devices, but would leave a poor signal on those devices that were horizontal. His accounts for both types of client devices connected to the network. As always, I think YMMV - so following your suggestion and playing with the antenna placement is best. I think wireless environments are very dynamic, and need to take in a slew of different environmental factors when talking about routers, and router placement etc. The way you prevent neighbors and "war drivers" from hacking into your WiFi is to use WPA2 security with good pass phrase. I use a sentence with nineteen characters including numbers and special symbols. Using a massive attack with 100 trillion gueses a second it is estimated that it would take 2.8 hundred billion centuries to crack my password. I think I would notice someone parked at my curb for that long. Using no more power than needed is curteous to everyone around you trying to use the limited number of WiFi channels but it really isn't necessary to increase your security. For someone to "crack" your security they do not have to be parked in front of your house! With a 25dB gain Yagi antenna, they could be quite a distance away. Since PKA2 is tied into your SSID, one of the safer ways to protect your system is to change the SSID from time to time. Don't think that hiding your SSID will help, it won't! more work on the user's part, but it is far more secure than single step. Some banks offer this as well as companies like eBay and PayPal. The FIOS Optimizer will only test the speed of your connection INSIDE Verizon's own network. Those are the speeds Verizon is "promising" when you sign up for a specific speed tier of service, your actual speed to sites outside Verizon are often not going to be as fast. To see what your real world speeds are go to an external speed test site such as speedtest.net. Go read the arguments in the press where Verizon and Netflix point the finger at eachother about who to blame for poor Netflix playback, I'm not going into that can of worms, but just keep in mind even though you may be paying Verizon for 50mbps for example doesn't necessarily mean you get 50mbps from every site out there. First off, if you haven't upgraded to FIOS Quantum, do it. In your Quantum upgrade package will be Verizon's latest router, which supports gigabit ethernet and better wifi radio than previous models without you having to pay the currently $75 Verizon will charge you for just a router upgrade without Quantum. 1) Get one of those free wifi signal strength apps on your phone/tablet/pc. I use Wifi Analyzer but pretty much any of them should suffice. Try out different orientations of your Verizon router (horizontal, vertical, rotation, etc.) as well as adjusting the angle of the antenna/antennas on it and watch how that impacts the wireless signal strength at the typical use locations in your house. You'll be amazed how just moving your router or antennas even small amounts can vary the signal strength to the rest of your house. Or something as simple as sitting it flat if it's standing upright now, or rotating it 45 degrees or such. 2) While using the analyzer app, take note of other wifi networks you can see in the various locations and what wifi channel they use. In general here in the USA routers are going to be on channels 1, 6, and 11 (these are spaced far enough apart to minimally interfere with eathother). You might find someone running an AP on some other channel due to the RF situation at their house, but that's actually pretty rare. Find which channel is the least used IN YOUR USE LOCATIONS and go into your Verizon router setup and force it to that channel. You'd think the router would be smart about what channel it selects, and it IS pretty smart, but when it choses a channel it choses based on signals where IT is, not where your client devices are. Those may not necessarily be the same channel. 3) By all means DO NOT USE WEP security, use either WPA or WPA2 (preferred) unless you absolutely have no choice because an old device of yours only does WEP. The protocol overhead for WEP is massive compared to WPA/WPA2, which greatly hampers wifi speed. Seriously consider upgrading any wireless device that can't do WPA2, not just for better wifi performance but the fact that WEP security is so easy to break it's a joke and is hardly any more secure than the wide open access points at your local coffee shop or fast food joint. 4) Consider relocating your Verizon router. You may need a Verizon technician for this if you're not handy with wiring. Moving the router to a different location in your house can make your overall wireless experience much better. Ideally you'd want to do temporary moves (get a big long piece of coax you can string around the house to different router locations you want to test) and repeat the analyzing to find the best new router site for your usage locations before you go tearing open walls and running permanent wires or calling Verizon to come do it for you. Also keep in mind when Verizon sited your router they likely chose a location nearest your main PC so that it could connect wired for the best experience, so if you go moving your router you may also have to consider moving that PC, switching it to use wifi (you can buy a wifi adater for pretty much any PC, some even plug into a USB port), or running an ethernet cable for it from the new router location. 5) If above doesn't help, consider disabling the wireless in your Verizon router and get a more capable router and run it in "access point" mode directly attached wired to your Verizon router. Most modern routers support this, which leaves your Verizon router still handling all IP networking chores and gives you far better wireless radios than you get in Verizon routers. You can get things like 5GHz (will help a LOT if you have a bunch of BlueTooth devices or cordless phones), dual band, the latest and highest wifi signal standards (i.e. 802.11ac), etc. Once installed, repeat the analyzer steps above to optimally site the new "access point". 6) If you have usage locations in your house that just can't get a decent strength signal with above, you may need to consider adding an "access point" nearer those distant locations. This is similar to #5, but you would site the additional "access point" somewhere that you can reach with an ethernet cable, don't disable the Verizon router's wifi, and make sure the new "access point" is on a different channel. If you name the wifi network the same on both, you won't have to have two different network names and passwords to remember, your wireless devices will connect to whichever is giving the best signal at a particular location. If running ethernet to this distant location isn't an option, you COULD consider using power line adapters (i.e. HomePlug) if your wifi situation is so extreme that you want to investigate the hurdles those entail. After all, they WILL provide a "wired" connection between your Verizon router and your new "access point", it just won't be nearly as fast as ethernet no matter what the proponents claim. 8) Last but not least, if nothing above helps or aren't an option for you, consider replacing the antennas on your Verizon router. There are plenty of sites out there where you can buy replacement high gain antennas that are literally a 10 second swap once received. Bad radio signals are bad radio signals though, and while a better antenna is likely going to imnprove your distant signals this option isn't a cure-all. Things in your house that obstruct or interfere with the radio signal are still going to do that even with a high gain antenna, and you likely can't change the antenna on your wireless device, but if you're out of options it's worth considering. Hope these tips help some of you. Yup, we've got the same problem out here in SoCal. I upgraded to the 150/150 FIOS from 75/75. The installer dude came out and did his best to dissuade me from completing the upgrade, telling me that Verizon has been pushing the faster speed FIOS to customers without upgrading the local infrastructure. Our FIOS is +150/+150 in the early morning up until about 11 am PST. Then, it starts to slow down throughout the day until it hangs at around 60/70, which is measurably slower than what we had with 75/75. The way the dude explained it is that we are in a similar situation as the old-style cable customers... the more who log on, the slower it gets - which isn't what FIOS is supposed to be about. I'm in So Cal too. We just upgraded and received the orange router. Speeds are supposed to be 75/75. My ping went down from 6 to 30 and speed test is 46/50 most of the time. It does depend on what time, and which day of the week you test it. I think that I'm at the end of the line so I just get the left over speed after everybody milks off it. Time Warner has hit the neighborhood hard promising a comparable TV and phone package but with an internet speed of 300mbps! How can they do that? I have it in writing but I know it is highly unlikely to get it. The monthly cost for the package is about $40 per month less than Verizon Fios with a $300 gift card that is to cover buying yourself out of your contract. Sort of tempting with the savings. I'm going to wait and ask the neighbors how it's going. Lots of installation trucks have been in the neighborhood. Because every Internet provider will only guarantee the speed of the link. Its like buys a Ferrari but being stuck on the 405. Yes the car can do 150+ but bottlenecks limit your speed.